What can I do with export/import? You can edit database data in external tools, such as Excel/Open Office/Libre Office or Google Sheets. BG Database provide export/import functions to xls files, Google Sheets and json (backup only). Full import/export works in Editor only, but you can update database data on players devices from GoogleSheets with LiveUpdate addon. No way to update GoogleSheets data from players devices yet. Use json export/import to create full database backup. 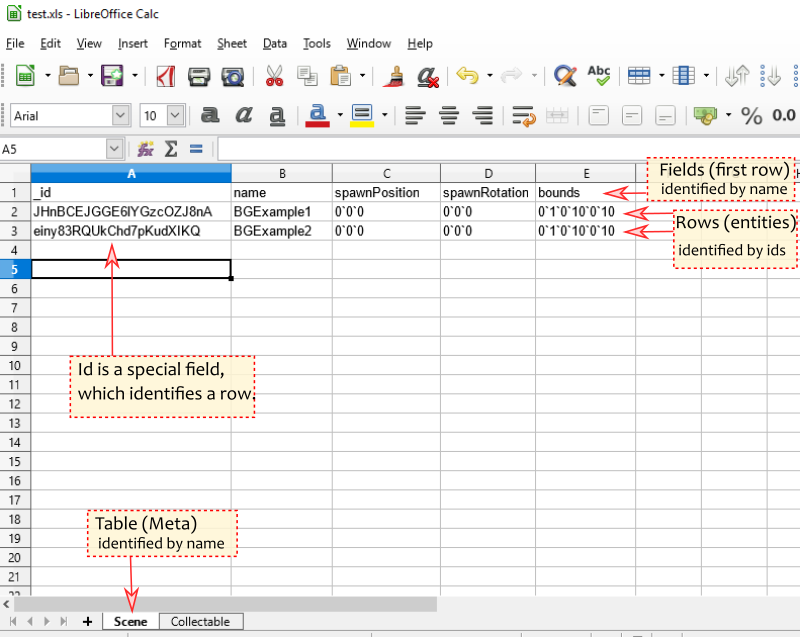 Here is the illustration about how BGDatabase data is mapped to spreadsheets. You have full control over which data you want to synchronize: you can add, delete, update and you can chose which fields you wish to update. Matching rows : they exists in the Source and in the Destination. Can be updated and you can chose which fields to update. Missing rows : they exists only in the Source. Can be added to Destination. Orphaned rows : they exists only in the Destination. Can be removed from Destination. Create your own C# class with unique name, set this class name to "Controller Type" field of merge settings (using the full name with namespace). IRemoveOrphanedReceiver public bool OnBeforeDelete(BGEntity toEntity) Callbacks to be called before deleting the row. Return true to cancel removal. IAddMissingReceiver public bool OnBeforeAdd(BGEntity fromEntity) Callbacks to be called before adding the row. Return true to cancel adding. IUpdateMatchingReceiver public bool OnBeforeUpdate(BGEntity @from, BGEntity to) Callbacks to be called before updating the row. Return true to cancel updating. You can find an example of such controller class on Save/Load addon page. Each row has it's own id- 22 symbols string. It's computer-generated value, based on Guid generation. Exporting data to json allows you to create a full database backup in human readable form as json file. With json you can not chose which data you want to be exported/imported, full data including database structure will be included. Why you do not provide an option to update GoogleSheets data from player devices? Durability problem: this is the main reason- there is no way to make sure some change will not erase previous change. Let's say you want to store the number of times your app was launched. So you read cell value, you increase it by 1 and you write it back. But if 10 players launch your game simultaneously, they all read initial zero value from GoogleSheets, increase it by one and write it back, so the final value will be 1, not 10. This problem apply to any shared data. Performance problem: GoogleSheets is not fast enough to be used as online database for big amount of users. Many tasks will require to read data first before updating, and it can take a lot of time. Also there is 2 million cells max restriction. All this problems can be solved with a proxy server, but it means there is no need for direct access to GoogleSheets. If you are still looking for a way to write data to GoogleSheets from players devices GoogleSheets dotnet API library v3 is probably the best starting point. There is also newer and better v4 version available (targeting Net 4.x), but we are not sure if it's compatible with Android and IOS devices.